In El Salvador, hundreds of thousands of people live on only a few dollars a day. Many of them live in crowded, unhygienic and unsafe housing in a highly seismic area. The standard low-cost housing solution in El Salvador is a simple reinforced hollow blockwork house. Whilst this has some advantages, it’s relatively expensive, heavy to transport, brittle in earthquakes and not very sustainable. The team began with reviewing the traditional bahareque construction technique (a derivative of ‘wattle-and-daub’), known as quincha in Peru, cuje in Cuba, pao pique in Brazil and tabiquería in other countries. 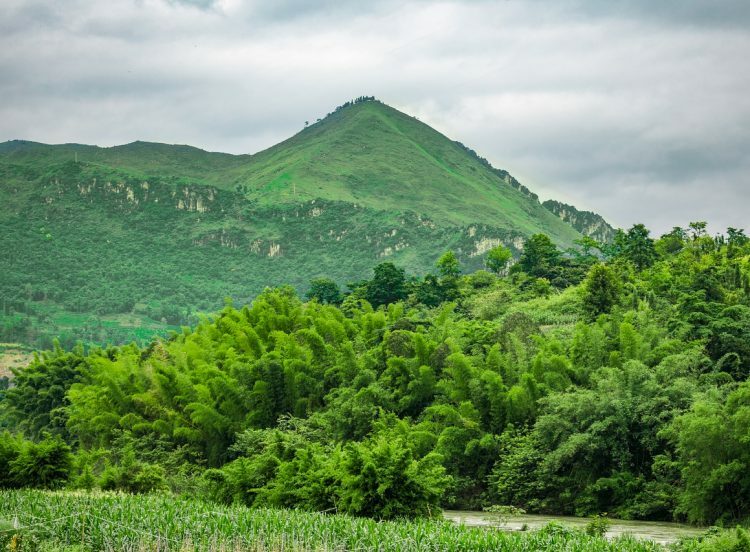 In El Salvador this system typically consists of a timber or bamboo frame, clad in a matrix of split bamboo, cane, twigs or timber strips, and finally plastered in manure or soil, sometimes with straw added for strength. Historically, the roof was constructed from palm fronds, but switched to cooler yet heavier tiles after the Spanish invasion of Central America (Figure 1). Properly constructed and maintained bahareque houses have been shown to possess good structural unity and flexibility, and therefore have a surprisingly high degree of seismic resistance. However, bahareque requires a reasonable standard of construction, detailing and maintenance so as not to deteriorate under rot or insect attack. 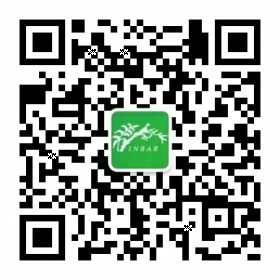 This is especially important since the naturally-durable hardwoods are becoming rarer and more expensive in the region, so much of the more recent bahareque stock has been built using less durable woods. Natural treatment methods used include ‘pig soap’ (a traditional soap made from pig fat and ash), however these are not entirely effective, and damage due to termites and borer beetles is still common. Therefore, frequent maintenance is essential, including periodic rendering and painting, replacing damaged elements and controlling water ingress. In addition, pre-colonial bahareque used palm fronds for the roofing, while the Spanish introduced and then enforced clay tiles– this change greatly increased the dead loads on the roof and hence the seismic demand placed on the structure. Another important disadvantage of bahareque is that it is prone to harbouring insects, notably ‘the kissing bug’ or chinche as it is known locally. This small biting insect can transmit Chagas Disease, a potentially life-threatening illness that is estimated to currently affect 10M people worldwide, mostly in Latin America. Existing research has shown many advantages of the vernacular bahareque technique, and also provided ideas on how this system could be improved. Following this, a comprehensive assessment of existing projects involving improved bahareque houses in Latin America was conducted. Modern engineered bamboo housing projects (a mixture of long term development and post-disaster) were reviewed in Costa Rica, Colombia and Ecuador, and visual inspections and interviews were conducted in order to determine the existing condition of the houses and the opinions of their occupants. The results of the assessment concluded that when well-designed these forms of houses have significant potential as a low-cost, sustainable, durable, seismically-resistant and appropriate form of low-cost housing. The assessment identified that despite bamboo or cane being commonly considered a poor man’s timber, a well-implemented housing project had the ability to change people’s perceptions of them. Additionally, the beneficiaries of the well-constructed houses expressed very positive views of the houses, with many now preferring them to masonry (generally viewed as the material of choice). Using this assessment, the weaknesses with the El Salvadoran bahareque were then explored, notably: durability and maintenance, a heavy roof and risk of chinche. With the knowledge that these could be overcome, it was agreed to improve the existing bahareque system in order to produce a vernacular-improved construction technique. 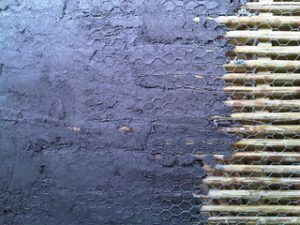 The team essentially takes the vernacular bahareque design and “engineers” it by: properly treating the timber and wall matrix against insect attack, replacing the mud render with a more durable and stronger cement mortar, and engineering the connection details. Research, community workshops and interviews ensured the new designs met the needs of local people. The design that has been developed is a single-storey four roomed building, approximately 6m x 6m, with two bedrooms, one living room and one kitchen. The foundations of the house are a thin reinforced concrete slab sitting on reinforced concrete ground beams under the walls. The walls sit on two courses of hollow reinforced blockwork, protecting the frame above from water and insect attack. 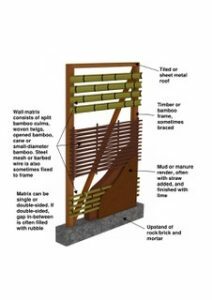 The wall and roof structural frame sits on the blockwork and consists of a simple structurally graded and pressure-treated pine frame, nailed together with steel straps at key locations to resist wind and seismic loads. 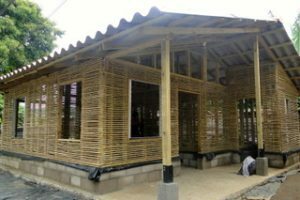 The use of large diameter bamboo for the structural frame was explored, however unfortunately it is not available in El Salvador in significant quantities and there is no long tradition of using it. The options for the wall matrix were cane, timber slats or split bamboo. 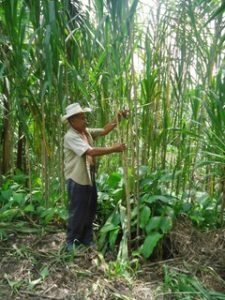 The cane species gynerium sagittatum (known informally as caña brava) was the obvious choice due to it being cheap, sustainable, quick growing, and readily available across the country (Figure 2). In order to protect the cane from termite and beetle attack, boron was selected as the most appropriate treatment chemical because of its efficacy against insects, its low mammalian toxicity and hence safety for use by communities, its low cost and its availability across the country as a fertilizer. The boron would be applied using the quick and effective dip-diffusion method developed in Costa Rica as part of their National Program for Bamboo (Figure 3). Next, the matrix is wrapped on both sides in a thin galvanised chicken mesh (Figure 4). Cement mortar is then plastered on both sides of the walls to form the 60mm thick walls (Figure 5). The lower halves of the walls are painted with waterproof paint to protect against driving rain. The roof consists of lightweight cement fibreboard sheeting screwed down onto the timber purlins and rafters (Figure 6 and 7). The design life of the house is 30 years with minimal maintenance (painting and keeping the walls dry). Full-scale testing of this mortar, cane and timber wall system was conducted at Imperial College London, Coventry, University and Cambridge University, and showed that the materials work well together and the design can in fact resist loads greater than the El Salvadoran code requirements. A full-scale shake-table test of a single room of the house conducted in the University Mariano Galvez in Guatemala also yielded excellent results.